to deploy the Imagicle ApplicationSuite. The Imagicle Virtual Appliance is a fully functional and ready VMware OVA including Windows Server 2016 Standard OS and Imagicle ApplicationSuite. It runs in 30-day evaluation mode (180 days for the OS) and can be also activated for production use by purchasing the Windows Server license and the Imagicle Applications needed. 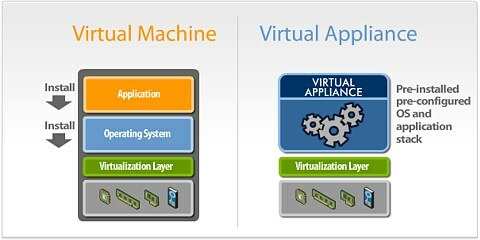 A virtual appliance extends the concept of a hardware appliance by offering the same benefits in a far more dynamic, scalable, and flexible way. 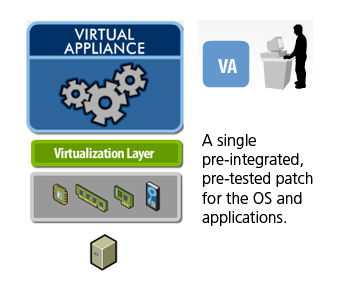 Virtual appliances eliminate the need for custom or third-party physical hardware and enable solutions to be run on a virtualization platform. Delivering software as a virtual appliance has numerous business and technical benefits, the end result of which is higher conversion rates, shorter sales cycles, and increased renewals. Virtual appliances let software developers address new customer segments, expand distribution channels, and provide easy-to-use evaluation and proof-of-concept editions. Because virtual appliances are packaged as simple files, customers can download the file and then click ‘power on’ to get a demonstration, evaluation, or fully licensed application up and running immediately with no need for an onsite Sales Engineer. A quick video about virtual appliances is available here. More info available here. The Imagicle Virtual Appliance OVA file includes Windows Server 2016 Standard OS and the Imagicle ApplicationSuite in 30-day evaluation mode (180 days for the OS), with hardware preset you can choose based on the size of deployment, starting from 2vCPU, 4GB RAM, 80GB vDisk. Just download the Imagicle Virtual Appliance on the Imagicle download tab to deploy on one of the above-mentioned supported VMware platforms. The Imagicle Virtual Appliance runs in 30-day evaluation mode (180 days for the OS) and can be activated for production use by purchasing the Windows Server license and Imagicle applications. Imagicle VAI credentials to access the Windows OS server are Administrator/ImagicleVAI. Admin credentials to access the Imagicle ApplicationSuite web portal are admin/admin. See the Imagicle system guide for detailed configuration steps for your Cisco Unified Communications environment here. For assistance with proof of concept, contact Imagicle Sales. The Imagicle Virtual Appliance ships with Windows Server 2016 Standard OS and the Imagicle ApplicationSuite in 30-day evaluation mode (180 days for OS). The OS can be activated with both an OEM, retail or volume license of Windows Server 2016 Standard Edition. If the customer has a valid product key for one of these, it can be applied through the simplified activation tool available on the Desktop of the Virtual Appliance. If you do not have a license and you need to buy a new one, follow one of the suggestions below. Imagicle recommends you to purchase MS Windows Server 2019 Standard edition Open License, to get access to the Volume licensing program and downgrade to Windows Server 2016. Windows Server 2019 Standard edition is licensed per core with a minimum of 16 cores, that are also the max required by the highest virtual machine Imagicle hardware requirements. The Windows Server 2019/2016 Standard Open License can be activated on 1 physical server or up to 2 virtual machines on the same physical server (1 POSE or 2 VOSE). It is not tied to a specific hardware, so can be moved to a different physical server during its life cycle. The average retail price of the Windows Server 2016 Standard Edition OLP 16 core + 4 CAL is roughly €1.050 in Europe and $1.050 in US/Canada/MEA regions. Note: If end users have an Enterprise Agreement with Microsoft, typical in medium to large companies, they will probably provide the necessary Windows Server license. You can save money by using OEM Windows Server 2016 (product code: P73-07113) from the hardware manufacturer or by purchasing the related product codes: no additional CAL needed. Moreover, Windows Server 2016 OEM Licenses can be activated on 1 physical server or up to 2 virtual machines on the same physical server (1 POSE or 2 VOSE). The limitation of the OEM version is the association with relevant hardware, which should remain the same during its whole life cycle. The average retail price of OEM Windows Server 2016 Standard Editions is roughly €600 in Europe and $600 in US/Canada/MEA regions.